The air quality database 'Airbase' contains validated information for more than 30 participating countries throughout Europe. Every year countries report air quality measurement data for a set of pollutants at a representative selection of stations. Reporting follows the requirements of the Council Decision 97/101/EC, a reciprocal Exchange of Information (EoI) on ambient air quality. Map air quality statistics at reporting stations. Every year countries report air quality measurement data for a set of pollutants at a representative selection of stations. You can examine the annual air quality statistics by using our collection of interactive maps. See interpolated maps showing air quality in Europe. The maps are derived from the measurement data at the stations in AirBase in combination with modelled output from EMEP and with other parameters. These maps are assessment tools for use at the European scale. They may show results which differ from assessments made at national scale. See where reporting stations are located, what their characteristics are and what they measured. Zoom in by clicking on the map or by writing the name of a place - to see the AirBase station locations in details. Click on a station to display its data. 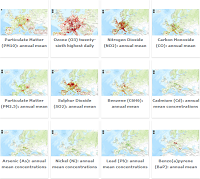 Validated: you can download the complete set of AirBase data (station and network information, air quality measurements and aggregated statistics) from EEA data service. A detailed technical description is available as accompanying information. AirBase reporting stations See where the AirBase reporting stations are located, what their characteristics are and what they measured. Zoom in by clicking on the map or by writing the name of a place - to see the AirBase station locations in details. Click on a station to display its data. Zones in relation to EU air quality thresholds - The latest data available at: http://www.eea.europa.eu/data-and-maps/data/zones-in-relation-to-eu-air-quality-thresholds-4 Every year EU Member States provide an assessment of air quality by comparing each of the EU air quality thresholds. The maps show information which has been reported for the zones designated by the country under the Framework Directive on ambient air quality (96/62/EC). Air Quality interpolated maps Collection of interpolated maps for O3, PM2.5 and PM10. For references, please go to https://www.eea.europa.eu/themes/air/air-quality/map/airbase/airbase or scan the QR code.